I love the LTH picnic. It's like the Green City Market BBQ, except more variety, more creativity, more weirdness, and more food. Do not take this as criticism, please. 1) Show up in the first hour or so with food, your food is snarfed happily and quickly and you get lots of response from happy scarfers. 2) Show up in the next hour or two, and your food winds up on a vast table full of similar things which are overwhelming to choose from or even contemplate. It grows warmer in the sun, and whatever is left is eventually taken home by somebody, probably, but if they liked it, who knows? Cathy insists that there's very little waste per se-- almost everything goes home with somebody. That's great. But still, I like seeing food eaten at its peak, not after 3 hours in the sun, and for the people who made it to get instant gratification. Especially I like seeing my food enjoyed this way. I have a small solution for this. It's not a solution for the planners to tackle, it's not even a solution for the majority of attendees/contributors. It's just a suggestion for a few individuals to take up for themselves, based on things I've observed at other large, complex picnic type events. It is: if your food could be easily portion served and passed out in little paper cups, on sticks or in some other fashion, why not do so, walking around with it on a tray and "selling" it to whoever you come across. If 15 people chose to do that, they would not only move their food faster (odds are, they'd be over and done with it in a relatively short time, and back to eating), they'd get more response from fellow LTHers, heck, they'd talk to and meet new LTHers which is never a bad thing. They'd increase the net interactivity of the event. The downside is that, in theory, you're increasing the paper used at the event slightly. Still, I think this is a minor cost or even a wash, if you decrease food waste. Or simply increase the net pleasurability of the event. Again, I don't suggest this as a policy. I simply plant it as a little bug in somebody's ear-- if your food might work this way, consider it and I think you might find you have an even better experience at this great event. And I look forward to trying your food! If you have small bites to easily pick up, you might consider walking through the crowd offering tastes to people. Just wanted you to know I do listen! I have not been to the picnic and I hope to make it. I do have a question. I might have missed this in the threads. What if you bring something to grill -- are there grills there or do you have to bring a grill? Are there name tags so people can know names at the picnic? I personally hate name tags but would be willing to do this at the picnic. Cathy2 wrote: Please advise if your food needs heating, grilling or smoking. 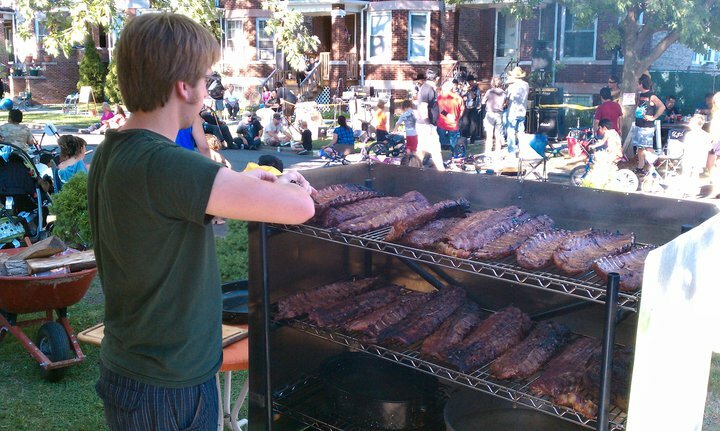 Plan to bring your own equipment unless you have arranged to share grill space on someone elses. If you have a tabletop grill, then be prepared to have it sit on the ground. In addition to that 6 a friend of mine, David, asked me to let you know he plans on coming but he doesn't use internet. So what's his connection to LTH? Mike G wrote: So what's his connection to LTH? The same as when others bring parents, kids or random friends. Its a picnic, friends we haven't yet met are always welcome. Even in this day and age you don't have to use the Internet to be fun, interesting and food centric. Sure, but this is a whole family who doesn't even have the most nebulous connection to our community. If it were me, I'd feel terribly out of place and wouldn't be at all comfortable intruding on this gathering. stevez wrote: Sure, but this is a whole family who doesn't even have the most nebulous connection to our community. If it were me, I'd feel terribly out of place and wouldn't be at all comfortable intruding on this gathering. They are obviously friends with laikom who, I am guessing, told them all about the picnic and LTHforum. Look at it as an opportunity to introduce them to both LTHForum and the Internet at large. Laikom mentioned they will be bringing food, long as they get into the spirit of sharing both food and a good time I am happy to have them. Its a picnic, we have a set forest preserve cap we will not exceed, they are friends with an LTHer, they are bringing food to share, I see no problem. I'm a little sensitive to this because at the holiday party last year I had to basically entertain some people who were dropped at a table by their "host" and were, plainly, mystified by the event, the weird food that kept coming, everything. They were done no favor by being invited, and neither was I. If they're the sorts who will fit in and bring great food, great. Some people can fit right in in a situation like this. But as Steve says, as the inviter, I'd just think about how well they'll enjoy themselves. One LTHer with a dozen people tagging along is a lot of non-board-participants to be responsible for the good time of. It's just something to think about. G Wiv wrote: Its a picnic, friends we haven't yet met are always welcome. as usual, I am with the G wiv on this issue. Suggest not changing rules in the middle of the game. Bad form. If this trend appears to be problematic, that should be tabled for discussion regarding next yrs picnic. This yr, it's still welcome one and all, one of the traits I love about our community. Equal opportunity eaters, one nation under food. One thing is guaranteed, Laikom always brings a lot of great food with him. Where did anyone say anything about rules? Really, I don't know how I could have been more explicit about NOT suggesting any policy beyond, the individual inviter should think about how much responsibility for the fun of others they want to take on, based on the people they plan on inviting. Some people blend right in, some will wind up imposing on others, some will be great additions, some will prove to be PITAs. All I'm saying is, think about that in your own case. It sounds good to blithely say "the more the merrier" but the party has worked in the past because of the community built between people online. That can stretch to accommodate some extra folks, but it's not unbreakable. I expect to hear shortly how disagreeable and unwelcoming I am, so really, before you post that, please actually read what I've written, and that I'm doing everything I can to make it not seem personal or directed at Laikom per se, but in the interests of everyone having a good time. Mike G wrote: Where did anyone say anything about rules? I don't think that's an unreasonable concern, especially given the fact that the picnic has now received media attention. In any event, once again I can't make it. I will be en route to Dallas to eat crappy hotel food at a 3 day work event. jesteinf wrote: I don't think that's an unreasonable concern, especially given the fact that the picnic has now received media attention. I don't think it's unreasonable either, considering the fact that I've met plenty of people at multiple large LTH events like the picnic who have said to me "I don't know what LTH is. I don't really know why I'm here. My friend dragged me." Think long and hard before revealing the secret handshake. WWMG do? I'm in the "big deal" camp who doesn't understand why the above is a problem. Then again, I'm not nearly as nice as Mike G, so if some yahoos I don't want to talk to start looking to me for entertainment, I'll just point them in Jazzfood's direction and walk away. Kennyz wrote: I'm in the "big deal" camp who doesn't understand why the above is a problem. Then again, I'm not nearly as nice as Mike G, so if some yahoos I don't want to talk to start looking to me for entertainment, I'll just point them in Jazzfood's direction and walk away. It's a big deal to me for events that have a cap and a wait list with LTHers on it. I'm not saying that the picnic is one of those events, but there are others. I guess sometimes i say too little when an explanation is required. I appreciate those who trusted my judgment.. I met David at a block party a few weeks ago, when i saw him dragging this (which he built the night before) out of his back yard. He and his brother had bought and were cooking 30 slabs of ribs, sausages, skirt steak and a few chuck roasts for no other reason than to share with everyone on the block, mostly strangers, and just because it's fun to do. I hung out with him all day helping with the grilling. He may not be and LTHer yet, but he obviously should be. He has the exact positive and sharing attitude that we all have. We talked a lot about LTH and he was very very interested, so I told him about the picnic and invited him. He was interested in all aspects of the picnic, even the weird food, but there's never a shortage of regular home cooking at the picnic for any of his kids that may not. I was invited over to another BBQ at his house, no shortage of ribs, with him again last week and confirmed his attendance. I guess I shouldn't have said he doesn't use the internet, I'm just guessing that he's not the kind of person that's glued to the web all day, like I am, or maybe he's just a little forum shy, and i understand how someone could be, so he asked me to RSVP for him. I think after he meets everyone he will hopefully become a contributing member of the forum. I just hope he doesn't feel unwelcome if ends up reading this conversation! Last edited by justjoan on August 31st, 2010, 3:46 pm, edited 1 time in total. laikom wrote: He may not be and LTHer yet, but he obviously should be. Judging by the pic & your explanation, I think you're probably right. I think Mike G's post applies to just about every social event - before one invites friends & relatives to tag along at a gathering, one considers if they would fit in & have a good time first. laikom, it sounds like you've already thought about this, and (probably correctly) concluded that your new friend will fit in just fine. If you have trouble thinking what that unwelcoming, clique-promoting, exclusive-invite-proffering Mike G would do, perhaps a few of these links will remind you. Thanks for the explanation, it offers a good understanding ... plus I know there is always a trail of food wherever you happen to be. laikom wrote: I just hope he doesn't feel unwelcome if ends up reading this conversation! After viewing his homemade BBQ contraption I intended to make him feel very welcome indeed, a man after my own heart. Seems I hit nail on head upthread when I said "friends we haven't yet met are always welcome"
Laikom, I am looking forward to meeting your buddy David.